Ticket prices are low in the Bundesliga: the average price for the cheapest tickets is just over £10. In the Premier League, fans pay upwards of £28 for the cheapest tickets. At Bayern Munich, you can get in (albeit to stand) for £12. Contrast those prices with £30 at the cheap end in Manchester United. For a season ticket, it averages £207 in Germany's top-flight games compared with £468 in England. 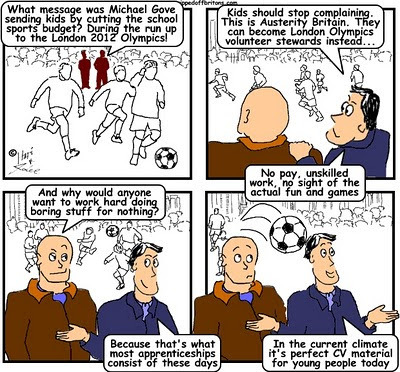 These figures come from a High Pay Centre report which looks at figures up to 2011. Bought by the American Glazer family for £790m in 2005 in a controversial deal which loaded the club with debt. Since 2012 10% of its shares have been listed in New York. Run as private company it is 82%-owned by its fans, with the sports goods firm Adidas and car company Audi holding just over 9% each. When Uli Hoeness, the president of Bayern Munich, was asked why the club didn't have higher ticket prices, like they do in England, he said: "We do not think the fans are like cows to be milked. 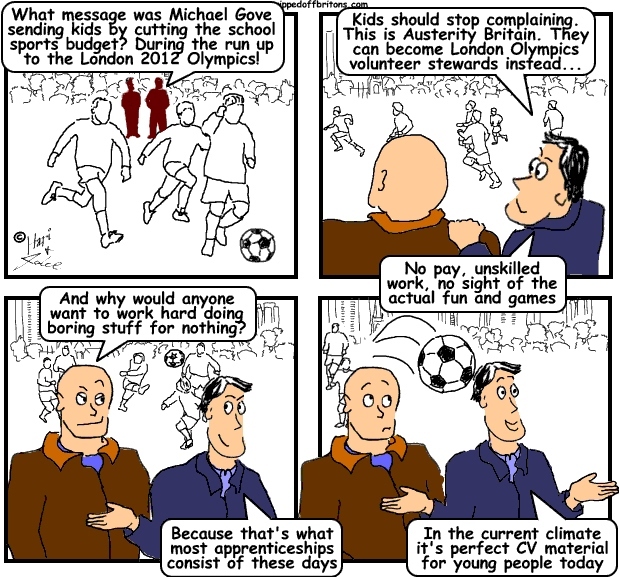 Football has got to be for everybody. That's the biggest difference between us and England." In the Premier League, assorted billionaires own the top clubs (Manchester United - the Glazer family; Manchester City - Sheikh Mansour; Chelsea - Roman Abramovich). In Germany, there is the "50 + 1" rule, whereby the association or club has to have a controlling stake so that commercial interests can't gain control. At Bayern Munich, for example, Audi and Adidas each own 9% but the rest is controlled by the members via the club. Above all, German clubs are genuine clubs: formally constituted associations with members who elect officials. In the UK the top clubs are listed companies, or largely privately owned. As a result, German Bundesliga clubs do not carry huge debts, like UK Premiership clubs. They rely much more on incomes generated and then invested in the game. According to the 2012 accounts for Manchester United plc, it is registered in the Cayman Islands tax haven and listed on the New York stock exchange. United remain burdened with £420m debt from the Glazers' 2005 takeover, at approximately 8.5% interest, which cost the club £50m last year. The takeover has cost United around £550m altogether. In 2013 the club paid a £10m dividend to the owners, a £3m management fee to the Glazers, and £558,484 interest was payable to Kevin Glazer. In Germany the members elect the president. With lower incomes from tickets, German clubs tend to put more weight on sponsorship deals, and tend to form close associations over the long term with local firms. Bayern gets 55% of its revenue from commercial deals with companies compared with 37% from that source for Manchester United. 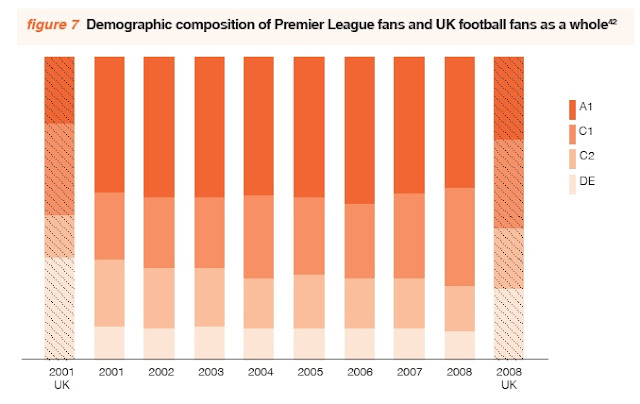 British clubs tend to get a bigger slice of their income from the fans. Despite these different was of generating revenue, Manchester United’s total revenue is typically only 10% higher than Bayern’s. Many Premier League clubs run at a loss. Most Bundesliga clubs run at a profit. According to Twentyfour7 Football magazine, Bundesliga clubs made a profit of £47m last season while the Premier League made a loss of £207m, even though the income to the British league was higher (£2.4bn) than to German clubs (£1.78bn). 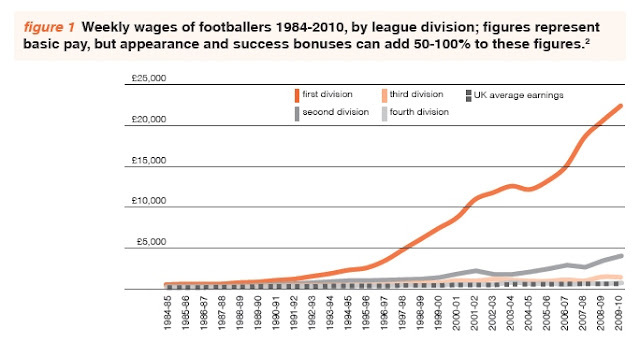 In the Bundesliga wages are 38% of the clubs' revenue while the in Premier League it is 67%. German clubs do buy stars. Bayern Munich bought Borussia Dortmund midfielder Mario Gotze (a German) for a reported €37m (£31.5m). But they also groom youngsters. Following the German national team’s humiliating elimination at the group stage of Euro 2000, Bundesliga clubs have since spent a total of £610 million on youth academies. It’s clear that the Premiership business model is not to dominate world football, it’s merely to dominate English football – or should I say the English football business. The top four or five Premiership clubs use their huge spending power to buy players, win games, win sponsorship and win TV rights. When it comes to English football the game is really over before it’s even begun. We know who the real winners are: everyone but the fans.